We specialize in all types of bridal jewelry, including engagement rings. 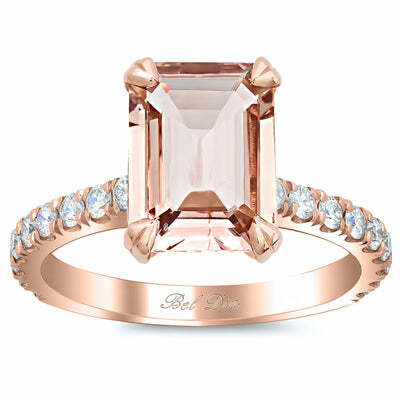 One of our most popular collections is our morganite engagement rings. We feature an array of different styles and designs with varying stone shapes and carat weights. Our emerald cut morganite engagement rings have been receiving a lot of attention due to their beauty and elegance. I wanted to highlight a few of our emerald cut morganite engagement rings that feature diamond accents. You can easily see why this is a beloved design. The pave diamond band brings sparkle to the wearer’s finger. If you take a look at the side view of the ring there is a surprise–we decorated the entire basket with accent diamonds. The center stone is a 2.50 carat emerald cut morganite, which will be selected by hand by our GIA graduate gemologists. If you prefer the look of a halo engagement ring, this is a stunning option. 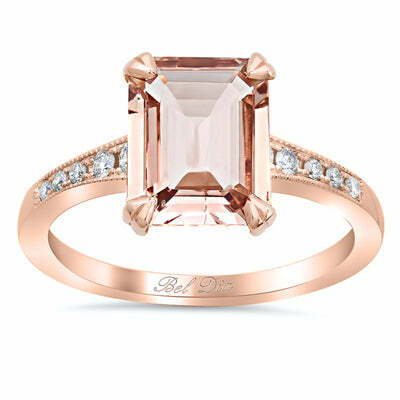 The ring features u pave set diamonds on the band as well as the halo, which surrounds the 2.50 carat emerald cut morganite. The ring is set with approximately 0.60 cttw of G color VS clarity diamonds. 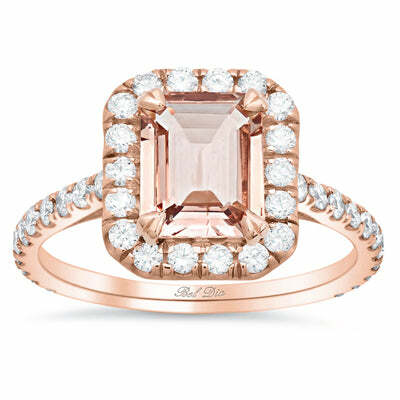 One of our classic and timeless engagement ring settings is shown here in rose gold with a morganite center stone. The ring is enhanced by subtle milgrain detail and pave set diamonds, which go part-way down the band. We use hand-selected round brilliant cut G color VS clarity white diamonds. Please browse our website to see all of the beautiful designs that we currently have available from deBebians. We have pear, round brilliant, and cushion cut morganite engagement rings, just to name a few. You may contact our jewelry experts at your convenience if you would like assistance in finding the best engagement ring for you.